Everyone’s at least somewhat familiar with the Scooby-Doo series of animated low-stakes real estate mysteries, correct? The one where a group of nomadic teens in a van roam the country stopping (usually) real estate developers from using Halloween costumes to force the sale of properties? You know what kind of van they drove? I bet you don’t. Well, I suppose our particular readership of Jalops may have a better guess than the population at large, because I’m fairly certain — from informal polling and rich, fulfilling life experiences — that most people believe that the Scooby-Doo crew’s van (known as the Mystery Machine) is a VW Microbus. I’ll attempt here to show why I think this is, and also to make a best guess as to exactly what sort of van it is. The Mystery Machine actually doesn’t quite seem to be a specific van, but a sort of hybrid of several possibilities, though I think we can find one particular one that has the most influence on the design. First, let me rule out once and for all the Microbus assumption. I think this is a fairly lazy assumption that’s based on the van’s general van-like shape and the presence of both the front-mounted spare tire and the large floral decals. Both of these elements are well-associated with the traditional ‘hippy bus’ VW Type II stereotype, and I think for most non-gearheads, that’s enough. But it’s not enough for us. The first clue this isn’t accurate is at the rear of the van. A Microbus would have an upper hatch for the luggage are and a lower hatch for the engine — the Mystery Machine has a pair of vertical doors that extend to the floor of the van — no room for a rear engine there. Plus, the Mystery Machine has a much more trapezoidal shape, and less of the bread loaf shape of a Microbus. It’s no VW. So, what is it, then? Here’s what I think we do know: it’s a mid- to late 1960s American van, cabover, with the engine most likely in a doghouse between the front seats, part of that series of smaller American vans that came about in response to the Microbus. It’s a set of vans that includes early Ford Econolines, Dodge A100s, Chevrolet Sportvan, and notably does not include the Corvair Greenbriar van, for the same not-rear-engined reasons as disqualified the VW. The Mystery Machine is not normally rendered with a lot of detail. There are a few constants: no really visible front air intakes, round headlights with round indicators below, large windshield, and a fairly pronounced beltline. Sometimes it’s rendered very angular and sharp, other times more rounded. Taillights seem to be small round units mounted low. Occasionally a twin-bar roof rack is present. Why Not Likely: The Econoline’s distinctive air intakes incorporated into each headlight unit are missing, and are such a huge design detail from this van that I believe if the intent was that the Mystery Machine was an Econoline, these would have been included. Also, indicator light shape is improper. Why Not Likely: The A100’s massive headlight bezels, like the Econoline’s air intakes, are just too distinctive a feature to ignore. The Mystery Machine’s lights are too small to suggest the A100. Plus, the A100 had multiple character lines down the sides of the van that are not suggested in the Mystery Machine. 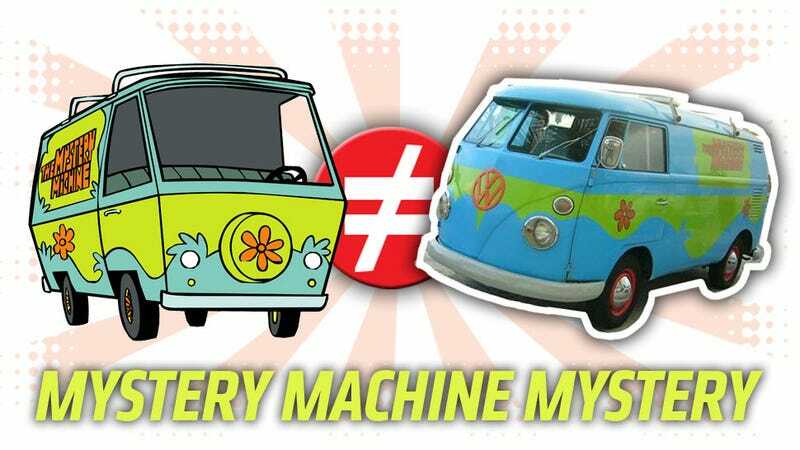 Why Possible: Very close general shape and proportions, headlight and indicator light size, shape, and location very similar to Mystery Machine, grille intakes could be completely (or nearly so) obscured with a front-mounted spare tire. Why Not Likely: Rear wheelarch too round, taillights wrong shape/location. Despite the minor differences, I think the Chevy Sportvan appears to be the closest van to the Mystery Machine, and is the one I’d pick if I was struck by lightning and my brain altered enough where I became committed to producing a real-world Mystery Machine replica. An interesting side note is that if Scooby-Doo and the gang were a bunch of go-getter teens from a collective farm in the central steppes of the Soviet Union, a UAZ 2269 would likely have been the Mystery Machine, or тайна машины. The front end actually looks closer to the actual Mystery Machine drawings than any of the American ones, but it’s just not likely Scooby and the gang would be rocking a UAZ. So, I’m calling it: the Mystery Machine was a 1961-1966 Chevy Sportvan. I’m sure many think I’m an idiot for this call, so I look forward to seeing why in the comments. Also, more detailed descriptions of what kind of idiot I am, too, I bet.